Guys, I have become one of those readers who neglects their other responsibilities because they are reading. My house is a mess, laundry is all over the place (clean AND dirty), and I don't even care, because I just want to finish the next chapter. I read SEVEN books this month, which is ridiculous to me. Who is this reading machine? And NONE of them were audiobooks, either! I've been trying out some new places to find books this month, including the awesome library in Pittsburgh, and some things directly from authors! 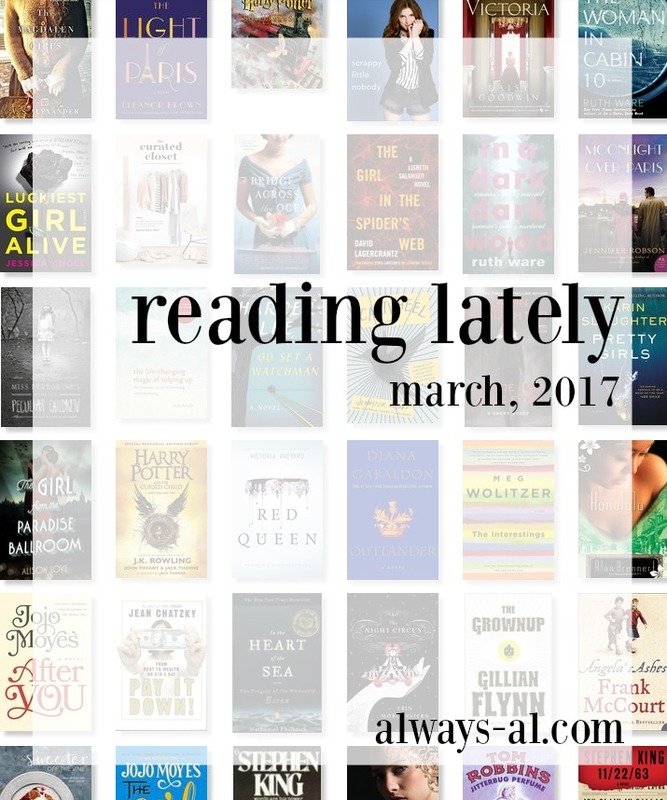 I love to write these posts so that hopefully you can add to your "to-read" list. Is there other information you are looking for from posts like this? What should I add/take away to make them more helpful? I would LOVE to know your feedback. I have to say... I didn't love this. It seemed really pieced together, and not cohesive at all. While I do appreciate a good personal development book, this one fell flat for me. I actually stopped reading it about 2/3 of the way through, because it just got so repetitive. There is only so many times that you can be hit over the head with the message of "be positive, help each other, be confident" before it starts to feel really preachy. This was recommended to me on my Kindle Unlimited subscription, and when I saw that it is coming out on Hulu, I knew I had to read it. I was terrified by this book. If you look at what is happening in the country right now, and how women's health is handled by our government... you'll realize that this hits very close to home. I really liked the character of Offred, and that we got to see what was happening through her point of view. Her memories were a little confusing at first, but when I figured out what was happening, I felt really bad. I definitely recommend this to anyone who has an interest in dystopian literature. I've read a couple of Mary Kubica's books, and really liked them, so I immediately picked this up at the library. It was a very quick read, as most of her books are, and I constantly wanted to figure out what happened. The story is written that you think one thing for almost the entire book, and then at the end the truth is revealed. I don't want to spoil anything, but I hated Esther until almost the end of the book. Guys I FINALLY finished this! There were some dry parts, but once I got into the story of Jack and Aliena, I was hooked. This could have definitely been two books, but I think it is tied together so well, almost like a braid of story lines. If you like Game of Thrones or Outlander, I think you would like this book a lot. Thank you Katie for lending this to me! This story was just not my cup of tea. I thought it moved really fast, and I kept getting confused by the different details in the plot lines. Maybe because this is part of a series, and things will wrap up (such as the random car chase that doesn't really ever come to anything?). Even though the resoution of the main conflict is not what you think it will be, I still liked how it was a learning moment for the main character, and leads him to be a better person. I did really like the characters, which is so important for me as a reader. They seemed so REAL, and their personalities were very different. Also I was glad that the romances ended the way they did. *This book was provided for review by the author. All opinions are my own. This was our book club pick for the Month of March. Talk about being relevant / dystopian societies / social media taking over the world. What happened with the Circle could TOTALLY happen to us. I felt bad for Mae for almost the whole book. She was constantly being criticized and mansplained to, and was made to feel that she wasn't enough. When she went transparent, I knew it was over. She was sucked in. She had been broken down so much that she was willing to believe EVERYTHING that the Circle told her. I didn't understand what the marine life meant, until the very end. That scene was incredibly creepy.